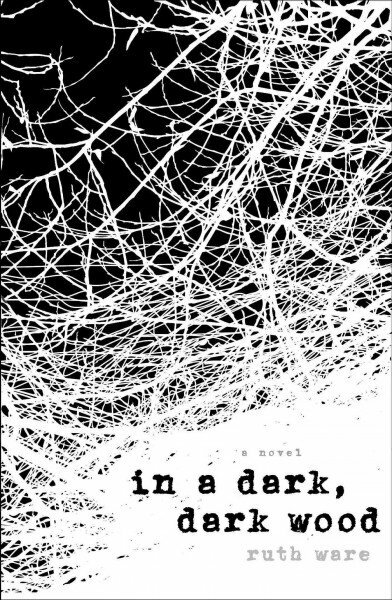 Posted on August 24, 2015 by Cynthia G.
Ruth Ware’s debut novel, In a Dark, Dark Wood, possesses all the best elements of a thriller: a remote country estate, a bachelorette party, and a group of frenemies that really, really should have scrubbed their email lists and left each other well enough alone after those terrible school days. But then, where’s the pleasure in that? The story is narrated by Nora, an author who specializes in crime thrillers. Back in school, she was called Lee, short for Leonora. Only one person ever called her Leo, and it was her first love, James. But then he broke up with her. . .via text. . .and she moved on. Ten years later, Nora is mostly okay, writing novels and living a fine, urban single life. Then one day out of the blue, she receives an invitation to an old friend’s wedding. Surprised, she feels a little sorry for Clare, thinking that maybe she has no other girls to invite, having to dredge back ten years for her bachelorette do. Nora is undecided about whether or not to attend the hen, but her invite is followed quickly by an email from Nina, who is also wary of Clare’s motives. “If you go, I will,” she says. Nora agrees and they somehow wind up traveling to the remote English countryside together. Nina hates the country and misses her girlfriend, and Nora is straightway filled with dread by their accommodations: a modern glass box dropped unceremoniously in a meadow at the edge of a dark and menacing wood. The house belongs to Flo’s aunt and feels to Nora like a dangerous cage, though it is only a country estate, complete with a shotgun hung over the living room fireplace. Miles from anywhere, cell reception is sketchy and the revelers are coolly irritable. When Clare announces to Nora that the reason she was invited to the hen and not the wedding is because the groom-to-be is the infamous James, the weekend really takes a turn. It doesn’t help that Flo’s hen party games involve embarrassing details about the bride and groom, shaming and humiliating Nora repeatedly. And then it snows. And then the land lines go out and the hen fete devolves into a churlish clutch of drunken, paranoid hostages. Fun! When the phones go down, Melanie decides to bail, a welcome excuse to return home to her infant son. Flo is alternately weepy and aggressive toward anyone who isn’t into the spirit of the weekend. Tom would rather be home with his husband but stays on, drinking gin and taking well-aimed shots at Nina and Nora. Clare plays referee, keeping anyone from coming to actual blows. After two days of slowly escalating hell, Nora wakes up in a hospital confused, horribly bruised, and under police watch. She is suspected of murder, but she can’t remember what happened. The harder she tries to recall, the more the truth evades her. Novelist Ware has created a deft and ominous page turner in this fabulous thriller, replete with plot twists, red herrings, and a truly scary villain. If you’re still looking for provocative poolside reading to finish the summer, this novel should do nicely. This entry was posted in blog, book review, books, commentary, creative non fiction, Cynthia Gregory, literature, perspectives, Relationships, women and tagged creative non-fiction, crime thriller, dangerous bachelorettes, fiction, genius, imagination, murder mysery, mystery, Ruth Ware, write by Cynthia G.. Bookmark the permalink.